I want to share my finished Herringbone Cowl with you. I first talked about it here. This is a case where looks can be deceiving. They ARE deceiving! 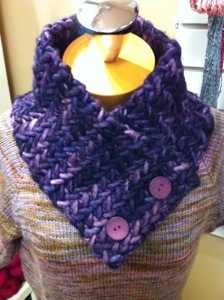 This gorgeous cowl is soft and squishy and oh so warm! The herringbone design gives it structure, preventing it from falling in on itself. The effect is a bit stiff looking but once you put it on-ohhhhhh heaven! I used a sample of Malabrigo Rasta that Kelley is considering carrying in Alpaca Direct. I am wondering if any of you have ever used it or would like to try it too?